We create innovative digital learning experiences that inspire people to develop the skills they need to thrive in their careers; enhancing and enriching the organisations they work in. We have a new brand identity! Click here to find out more. We are consistently ranked amongst the UK’s top e-learning providers. We were gold and silver award winners at the Learning Technologies Awards 2017, including the gold award winners for excellence in the design of learning content. Choose from over 300 interactive e-learning courses. Popular topics including food safety & hygiene, health & safety and safeguarding children. Learn new skills in a couple of hours, earn CPD points and get an instant certificate upon completion. We’ve worked with hundreds of organisations to help them improve the way they deliver training and measure its effectiveness. Whether you need custom e-learning content or help with a new training process, our expert advice will support and guide you. 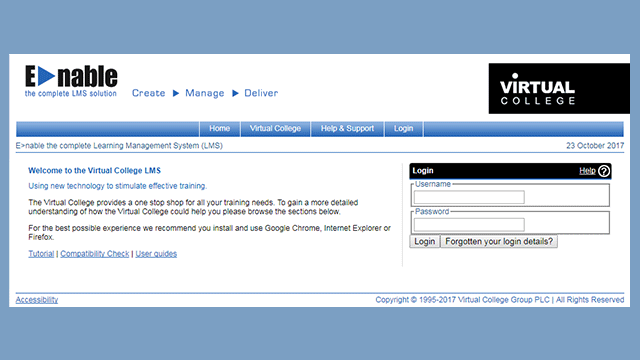 Virtual College's training software includes Enable - our third-generation learning management system (LMS) and Audit - an online system that makes creating and sharing audits quick and easy. You can use these tools to manage training wherever you are in the world. Whether we’re creating custom e-learning content to make an impact in the workplace, or software to help organisations seamlessly manage staff training, we always have one outcome in mind, that digital training should be inspiring and make a real difference for those who are using it. Virtual College has worked with NICEIC to create these modules and resources in order to provide you with the knowledge and skills to demonstrate your understanding of the 18th Edition. As well as learning modules, there are also mock exams and learning games. Would you spare 45 minutes to save a life? Prepared To Save a Life is a free online course designed to provide basic life-saving skills for all. Find out more. This First Aid training course has been created by Virtual College, in partnership with First Response Training. The course will teach learners to follow the Resuscitation Council (UK) Guidelines for basic to advanced life support training and provide knowledge of how to act in the event of an incident requiring first aid assistance. Awareness of Health and Safety at Work aims to improve employers' and employees' understanding of what is required of them under the Health and Safety at Work Act 1974. Enable is a cloud-based learning management system (LMS) with a user-friendly interface that is simple for learners and administrators to use. It allows learners to take courses, save progress and show their understanding. It lets administrators assign training, check progress and report quickly. Whether your existing LMS is out-of-date or you’re looking to introduce an LMS into your organisation, we can help. 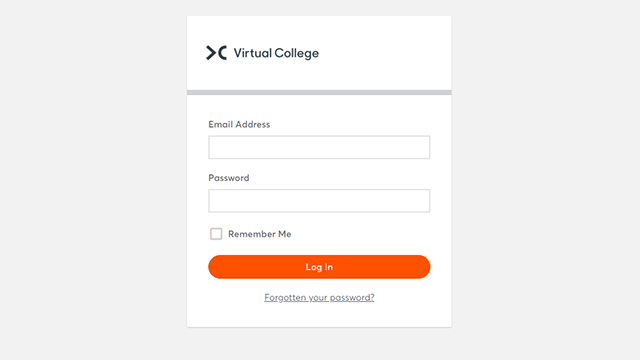 I was very impressed with the quality of work by Virtual College and their commitment to delivering our solution. There are many ways in which e-learning can bring cost savings - both directly in terms of travel and accommodation costs, and indirectly due to the fact that you don’t have to take time off work or reschedule jobs to accommodate training. The flexibility of Virtual College’s online learning is ideally suited to our 24/7 working environment, allowing us to reach a large number of learners quickly with minimum disruption.